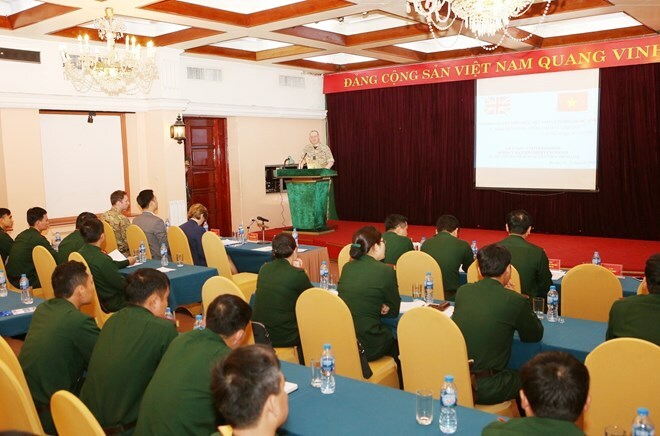 Hanoi (VNA) – Vietnamese peacekeeping sappers are studying the UK’s experience about sexual violence prevention in doing peacekeeping missions at an exchange programme held from March 17-21 in Hanoi. The event is jointly held by the Vietnam Peacekeeping Department (VPD) under the Ministry of National Defence and the UK Defence Attache Office in Hanoi to assist Vietnam in deploying a peacekeeping sapper unit by 2020. It will also help improve capacity of VPD lecturers to organise training course on the matter for Vietnamese peacekeeping forces before taking up missions overseas. Main contents in the exchange programme include basic principles of the International Humanitarian Law, especially those regarding preventing and fighting sexual and gender violence against civilians, and how to prevent discrimination against victims and support them to reintegrate into the society. Participants are also equipped with knowledge about international laws and resolution of the UN Security Council relating to human rights, and international instructions on the protection of civilians, focusing on women and children. The exchange is also set to raise the soldiers’ awareness about their responsibility towards women and children while fulfilling their UN peacekeeping tasks. Addressing the opening ceremony in Hanoi on March 18, Colonel Nguyen Nhu Canh, deputy head of the VPD, said the exchange is particularly useful in the context of the fruitful development of defence ties between Vietnam and the UK, as well as their cooperation in UN peacekeeping operations.